Sneak Peak Into our Brisbane Workshop! 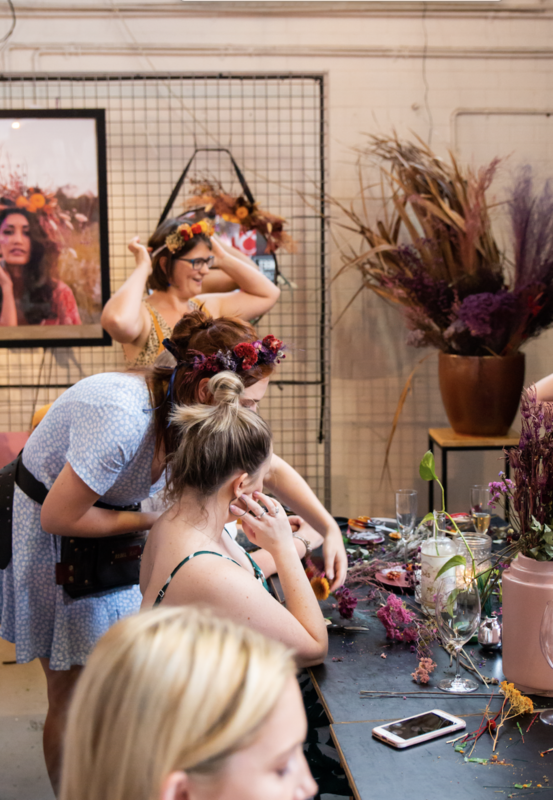 When I was working and living in London I noticed that during the summer festival season there was always a fresh flower crown stall to get your boho fix. They create such a whimsical and magical atmosphere and you do feel like a woodland nymph with one on! I really wanted to bring this idea to Australia, but sometimes the climate, especially in Brisbane, wrecks havoc on the delicate fresh florals. So we decided to use the same technique to create everlasting flower crowns, and use materials that are dried, the result turned out to be much better than expected and since we started making them we’ve taught over 100 people how to make their own! Last Saturday we held another workshop at Wandering Cooks in South Brisbane and we had 16 participants in house ready to learn! Follow a few a tips that I mentioned in the workshop and I hope you’ll get a better understanding of how to make one. 1. Tools! - you can grab all of these materials at Koch & Co.
2. 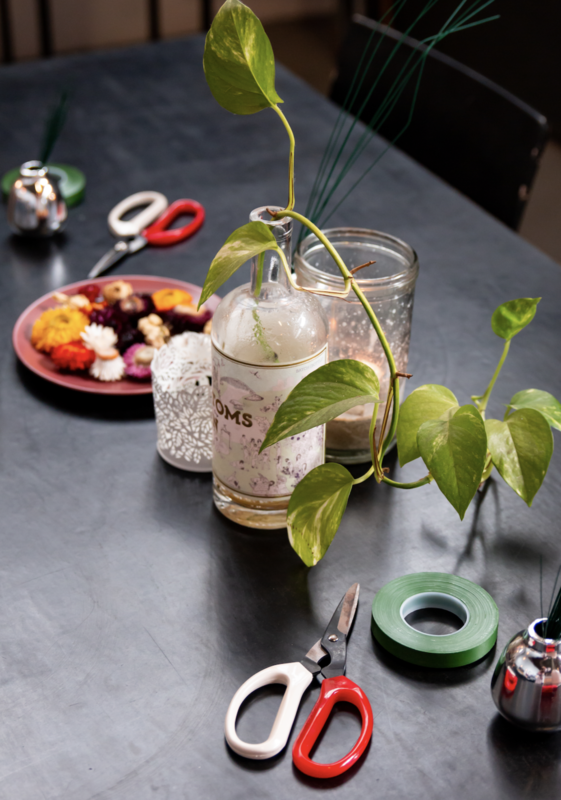 Individually Wiring Stems (thin wire) - substitute the natural stem of a flower for a wired one, this allows you to bend, shape and strengthen the flower. Always parafilm over bare wire to ensure the wire won’t poke you! 3. Curve Base Wire (thick wire) - curve your base wire along the shape of your head and add individually wired stems to the curve, this ensures no gaps at the end! 4. Placement - after you’ve created a hook for your ribbon to attach, place a variety of materials along the base wire, keeping them close, in the same direction and alternating different textures along the wire. 5. Ribbon Ending - finish with another hook to attach your second ribbon, tie underneath your head and have a look in the mirror! We covered all this and more with a vino in hand and chats with new friends to be had! 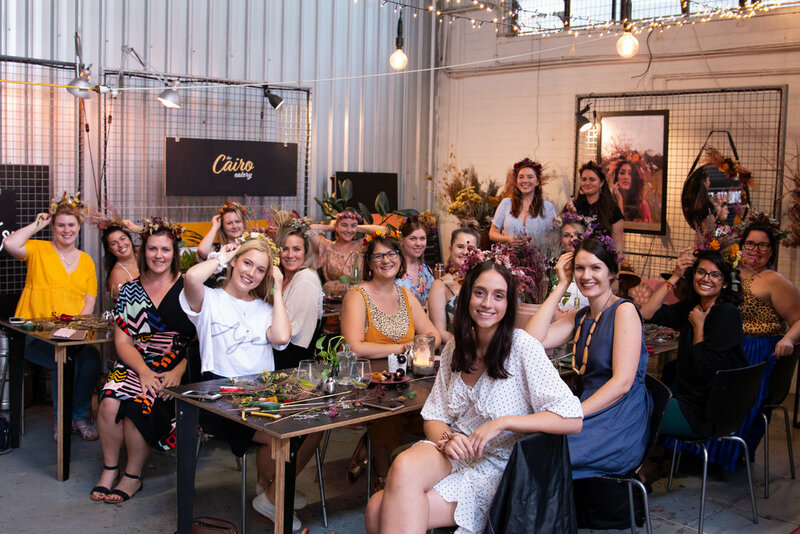 Everlasting Flower Crowns are great because you can keep them until you head to an event for race day, your birthday, a hens night, or just keep it attached over your mirror forever. We love teaching people new floral skills and it’s always so rewarding seeing people amazed at their own handiwork. It’s the best feeling! The amount of people who say to me ‘but I’m not creative’ then two hours later they are incredibly chuffed about their own creation…. All the above images were photographed by Jess at Folk and Fawn. Thank you to our participants last Saturday, it was a beautiful ‘crafternoon’ and if there is anything that you want to learn at our next workshop, please let me know! I know I’m a bit late to the party but did any Melbourne friends see the installation of 35,000 red tulips that appeared in Hosier Lane last week? 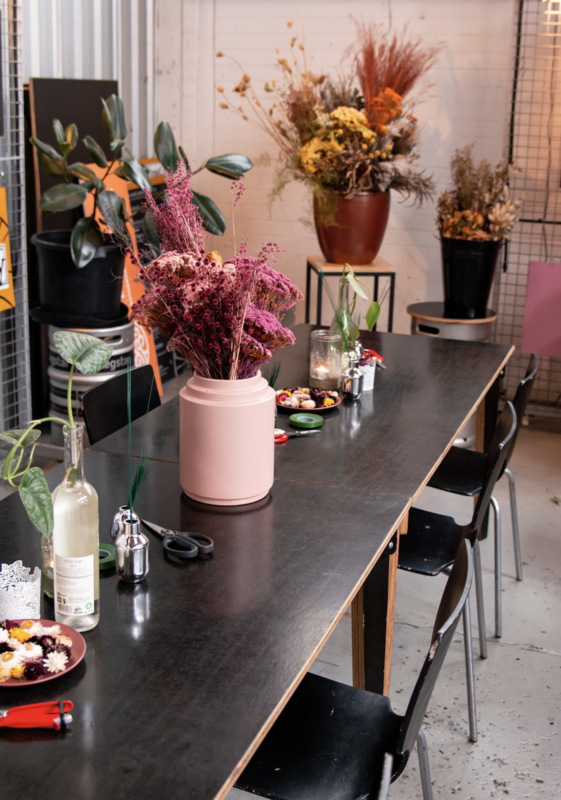 If you need some catching up, a local flower grower in Victoria Joost Bakker decided to giveaway the ‘not quite good enough to sell’ tulips to the public in one of Melbourne’s most iconic laneways. The result is a breathtaking, ‘grammable installation that aims to bring awareness to local flower growers in this country. Bakker said the industry is currently under pressure from imported flowers with some estimating close to 70% of flowers sold in Australia are imported. It’s kind of unfathomable, that a country with so many different climates, has to rely so heavily on imports from overseas. When I was working in London, sometimes you were visited by ‘The Flying Dutchman’, which sounds like a very nice dream to have….. but, as it turned out, it was just what we called a Dutch flower lorry. It was a never-ending flower wholesaler on wheels that made you feel like you were walking inside Mary Poppins carpet bag. And it would drive from the Amsterdam markets to your front door in London in less than half a day. As a gigantic island in the middle of nowhere, you’d think we would have more of a focus on creating a local and sustainable cut flower industry, things can’t even be flown to us in less than half a day. Below is just a little reminder of what we are dealing with here. What’s funny is that most British florists are so adamant about buying British flowers wherever possible (as they should be! ), and one of the main reasons is just that flowers decrease in quality the longer they travel. We can’t change our geography, but we can push for Australian grown flowers. We make these decisions as the consumer. Whether you’re an appreciator of flowers and splurge on your special bunch once a month, or you’re a florist spending up weekly at your flower market, it’s about asking those questions and putting your money in a local farmers pocket. And once you have the answer, let’s share the knowledge. Let’s tag our local flower farmer in our designs on social media, we owe it to ourselves to engage in the conversation, to educate our customer, to promote industry growth and support fellow local businesses. In the end, there were hundreds of people wandering through Melbourne CBD clutching a handful of tulips. And if flowers mean anything, it’s the simple joy they can bring just by being naturally beautiful. To see a World in a Grain of Sand. And a Heaven in a Wild Flower - William Blake. Do you have a favourite flower farm in Australia? Do you ask your florist about where their flowers come from? Would you pay more for flowers grown locally? Are there any flower farms in South East Queensland or Northern New South Wales that would let me visit so I can educate myself further and perhaps attempt more writing? This is my first piece of ‘creative’ writing since high school drama, so really, it should be only up from here!